Day after day tanning by the pool on your luxury cruise ship, stuffing yourself at the buffet, casually perusing the duty-free shop, and greeting the various towel-creations in your cabin can sometimes get a little monotonous. But if you take all that good stuff and add, say, pro wrestlers, or Kid Rock, or a bunch of swingers? That’s the brilliance of the theme cruise. There are some theme cruises out there with universal appeal — who doesn’t love Disney, right? — and then there are some more specific cruises that might not be for everyone. Like, an ocean liner full of cat ladies, or an Alaskan voyage where every port-of-call is a visit to a new yarn shop. Here are the some of the weirdest theme cruises the world has to offer. 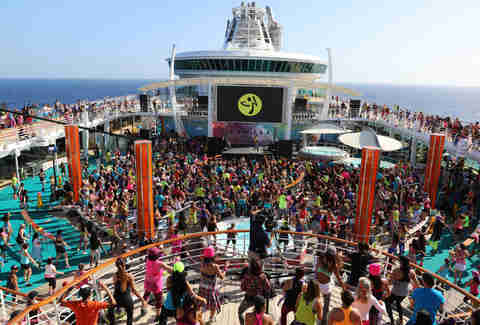 What we have here is a sea of neon spandex doing fast-paced, choreographed dances on a lilting ship deck in 80+ degree heat. Laugh all you want, but Zumba is no joke! It’s probably not even the most physically challenging theme cruise in the world, but it’ll certainly have you sweating and giggling much more than usual. Itinerary: We’re not letting them know where we’ll be. A ship overrun with a zombie outbreak sounds like a pretty badass horror movie. Feel free to take that idea and run with it. 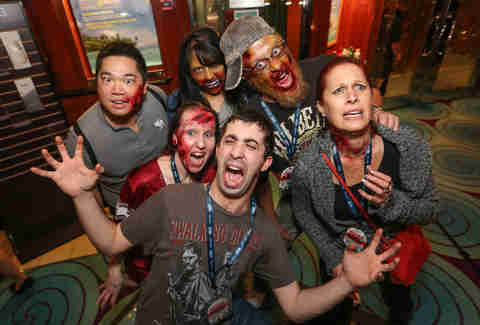 On this four-day Bahamas cruise, fans of The Walking Dead spend their vacation dressed up like zombies, attending zombie panels, and getting made up by professional makeup artists. Even more exciting, they get to meet stars of the show and take zombie-selfies to what’s left of their heart’s content. 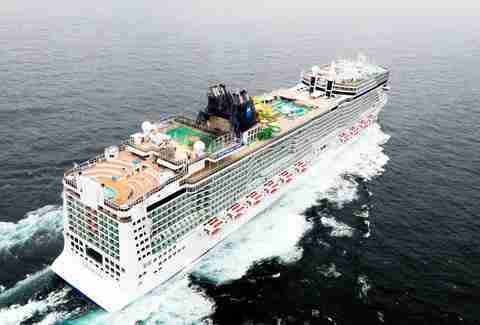 This year’s cruise saw Michael Cudlitz, Katelyn Nacon, and others onboard. More frightening than a ship full of fake zombies is a ship full of people who regularly upload cat videos to YouTube. 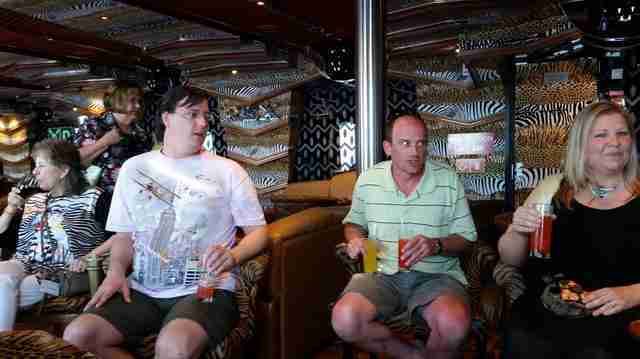 The annual Meow Meow cruise, which ironically doesn’t allow felines onboard, caters to the people who love them. The activities read a little like a bit from Super Troopers, with names like the Meow Meow Mixer, Meow Meow Trivia, and Meow Meow Scavenger Hunts. But ultimately it’s a cruise like any other, just jam-packed with people who have cat magnets on their fridge. The inaugural NASCAR cruise in January saw former-drivers Richard Petty, Davey Allison, and Rusty Wallace join throngs of obsessed fans, with performances from the Beach Boys, 38 Special, and comedian John Heffron. 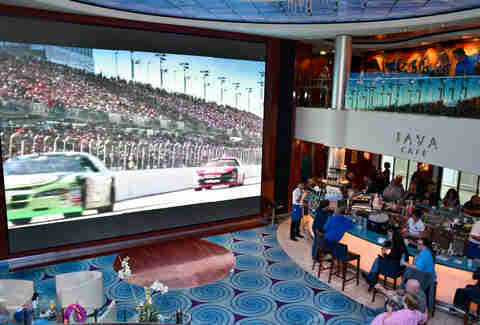 The best part: The cruise is held during NSCAR’s brief off-season, so nobody has to anguish about streaming the Save Mart 350 over cruise Wi-Fi. Nobody’s trying to say the Norwegian Pearl is haunted, but why ELSE would stars of Ghost Hunters choose that ship to spend a week educating passengers about the paranormal? By no coincidence, the cruise leaves from one of America’s most haunted cities New Orleans, and offers ghost hunting shore excursions as it sails along the eastern coast of Mexico and Central America. No ports of call for these titans of conservative ideology! In true Republican fashion the folks behind the nation’s leading intellectual conservative magazine have booked the Queen Mary 2 for a transatlantic voyage, where the days are filled with seminars from the likes of former-Attorney General Michael Mukasey, novelist Mark Helprin, and NR columnist Rob Long. At night, passengers let loose with cocktail parties and H. Upmann cigars. Though you might say to yourself “A week stuck on a ship with a bunch of Republicans sounds about as exciting as a Ted Cruz filibuster,” well, keep in mind that when the RNC was in Tampa four years ago you couldn’t get a seat at Mons Venus. 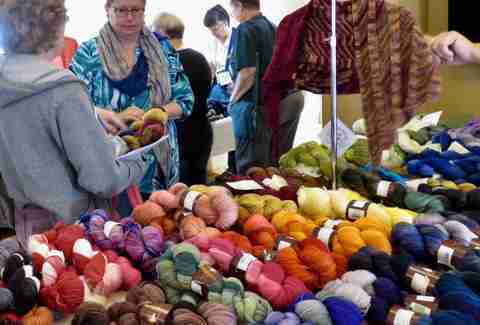 The knitting cruise is but one niche in the entire genre of craft cruises, which runs the gamut from knitting to crocheting to needlepoint. And the Alaska itinerary is one of 14 knitting cruises worldwide. Onboard, passengers learn the finer points of their craft from experts in the field. And during ports of call they make visits to specialized yarn shops, markets, and craft houses. No jokes to be made about these knit-crazy cruisers, I bet they’re just the nicest people. Imagine those Star Trek conventions you stumble on at the mall. Now take all those people and put them around a swimming pool with massive amounts of tropical drinks. 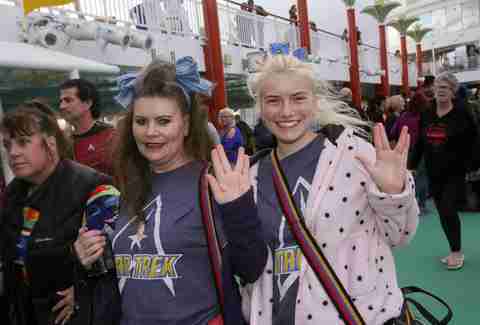 George Takei takes a small break from Twitter and heads the lineup of Star Trek alums who pack the Norwegian Jade for a week of Trekkie Valhalla, where events like Risa’s Festival of the Moon Party and Starfleet’s Intergalactic Gala headline the nights. The days are filled with chess tournaments, Q&As with former starts (LeVar Burton FTW! ), and Star Trek-themed-bars. Matt Meltzer is a contributing writer to Thrillist. Follow his travels on Instagram@meltrez1.